10th of November 2011: Challenge dataset with complete labels released. Follow this link. For this challenge we use a subset of the Opportunity dataset. 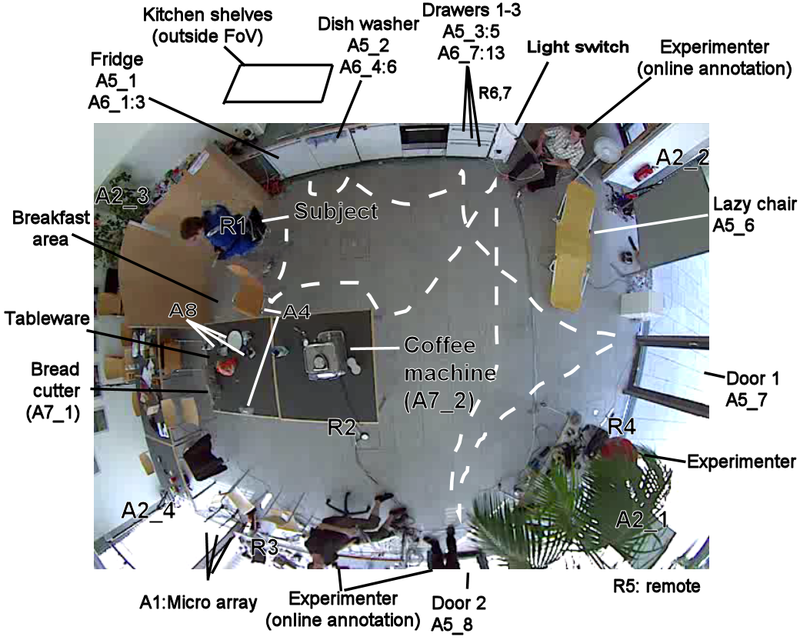 This database contains naturalistic human activities recorded in a sensor rich environment: a room simulating a studio flat with kitchen, deckchair, and outdoor access where subjects performed daily morning activities [1,2,3]. Two types of recording sessions were performed: Drill sessions where the subject performs sequentially a pre-defined set of activities and "dayly living activities" runs (ADL) where he executes a high level task (wake up, groom, prepare breakfast, clean) with more freedom about the sequence of individual atomic activities. We deploy 15 networked sensor systems of different origins (proprietary and custom, from different manufacturers or universities). 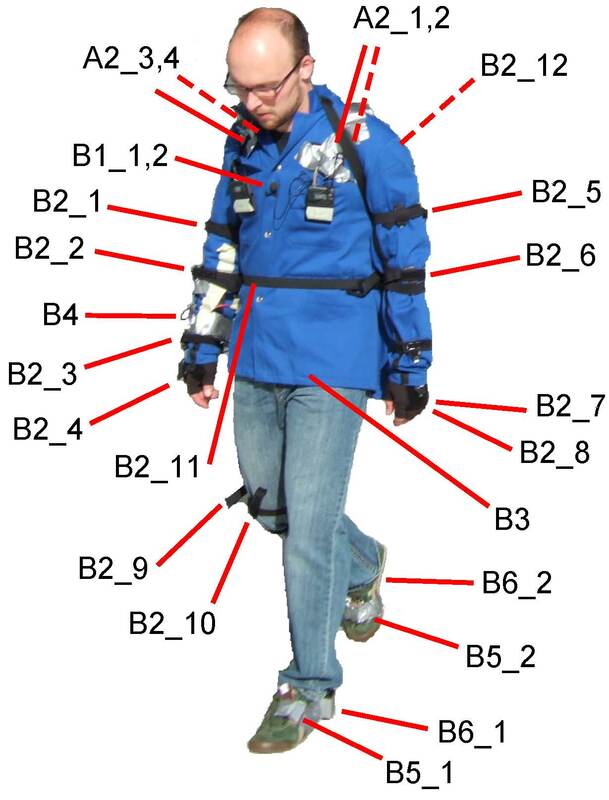 It comprises 72 sensors of 10 modalities, integrated in the environment, in objects, and on the body . 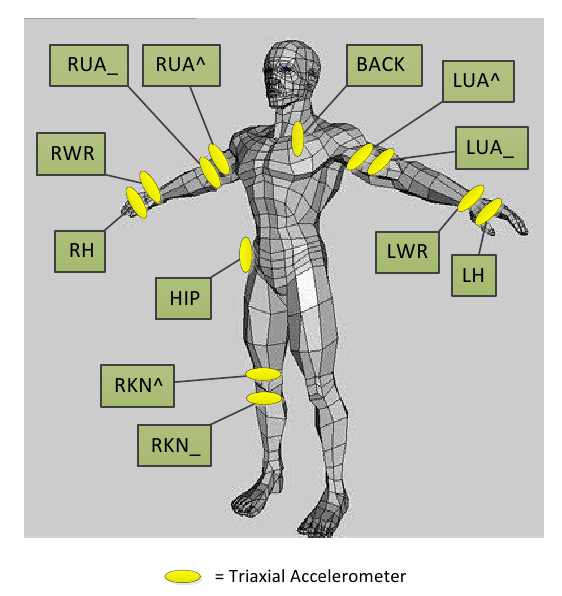 The full setup including both ambient and on-body sensors is illustrated in the figures below. It consists of an annotated dataset of complex, interleaved and hierarchical naturalistic activities, with a particularly large number of atomic activities (around 30’000), collected in a very rich sensor environment. Data was manually labelled during the recording and later reviewed by at least two different persons based on the video recording. The full dataset will be made available shortly after the end of the challenge. When using this database, please refer to the two papers listed below. The data used for the challenge is composed of the recordings of 4 subjects including only on-body sensors; for each subject we provide 5 unsegmented recordings. We also provide labels for the full recording of one of the subjects. For the remaining subjects, labels are available for four of the sessions while the last two session will be used by the organizers to evaluate the performance of the contributed methods. The labels for these recordings will be made public after the submission deadline date. Labelled data can be used by participants at their own discretion to tune their methods. The following table shows an illustration of the provided data, where (●) denotes sessions for which the participants receive the labels. 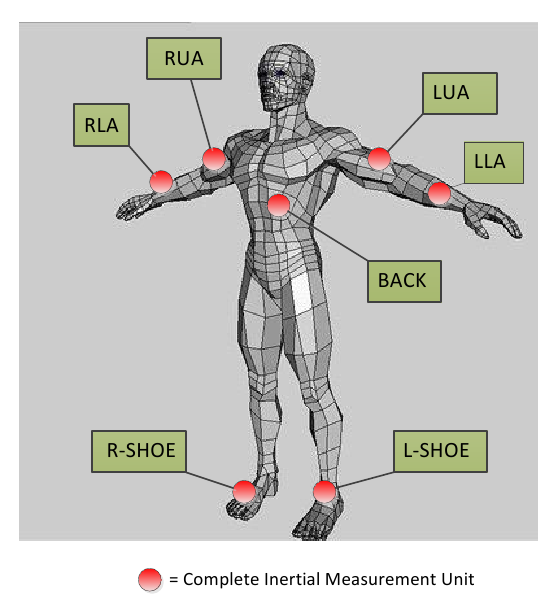 The image below show the location of the on-body sensors used in the challenge. The subjet wore a custom-made motion jacket composed of 5 commercial RS485-networked XSense inertial measurement units. In addition to 12 Bluetooth acceleration sensors on the limbs and commercial InertiaCube3 inertial sensors located on each foot.